RRB Group D 62907 Vacancies Form 2018: Taking cognizance of the Upcoming Recruitment through Central Employment Notification (CEN) 02/2018 likely to be initiated From 10th of January 2018 (10.02.2018) to 12th of March 2018 (12.03.2018) by the Railway Recruitment Board under Group ‘D’, we have been given to mention as here. The Ministry of Railways, Indian Railways, is set to Direct the Railway Recruitment Boards / Railway Recruitment Cells to Release Employment Notification No. 02/2018 for Recruitment under Group ’D’ against 62907 Vacancies. Recruitment against 62907 Vacancies shall be by the Railway Recruitment Cells / Railway Recruitment Boards. 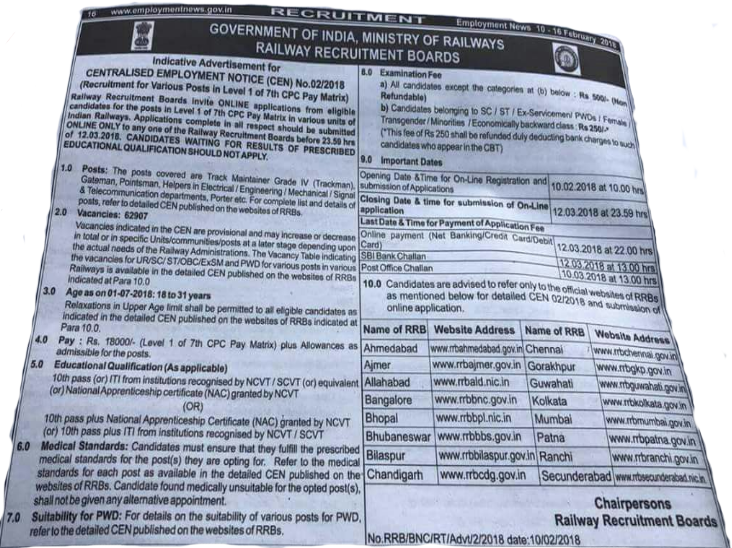 We would like to Advise the Candidates to Carefully Read the Railway Recruitment Board Central Employment Notification as Only Candidates meeting with the Eligibility Criteria shall be able to Apply for the Posts Opted for, we would like to Advise the Candidates to Carefully Read the Railway Recruitment Board / Railway Recruitment Cell Central Employment Notification. The Competitive Written Examination will consist of different Sections / Tests comprising 120 Multiple Choice Questions of Objective Type carrying Equivalent Maximum 120 Marks, with each Multiple Choice Questions carrying 01 (One) Mark and Examination Duration shall be 1½ Hour or 90 Minutes. Merit List shall be drawn up based on the Candidates’ individual Performance and those securing either Equal to or Higher than the Prescribed Expected Cut-Off Marks shall be shortlisted for Aptitude Test. However, the Candidates with Sufficient High Marks secured in the Computer Based Online Test would be placed on Merit List.